John P. Weldon was John Paul Weldon (1870?-1942?). He was the son of Patrick Moreland Weldon (1822-1902), an immigrant from Ireland who founded the Weldon iron works, New York City, approximately 1846. Doggett's New York City Directory listed Patrick Weldon, whitesmith, at 31 South William St. in 1846-47. The following year the address changed to 81 Broad St., and Patrick Weldon continued at this address as either whitesmith, blacksmith, locksmith, or smith through 1870. In 1871 he moved to 34 Stone St. as Patrick M. Weldon, iron, where his name was listed with John Weldon, railings. Patrick M. Weldon was listed at 34 Stone St. through 1902. Patrick M. Weldon died 17 August 1902, age 81, when he lived at 384 Hudson Boulevard, West Hoboken, New Jersey. The business at 34 Stone St. was continued by John P. Weldon through 1919. It relocated from 1920 through 1925 to 829 Greenwich St., and then closed. John P. Weldon's birthdate is uncertain. The 1900 U. S. Census recorded him at age 29, born March, 1871. The New Jersey Births and Christenings Index, available on ancestry.com, however, has "John Paul Weldon, born 16 March 1870, West Hoboken, New Jersey." I am not sure about his death date, either. The website, www.hudsoncountynjgenealogy.org, records "Weldon John 3 Feb 1942," which is probably him, but I can't be sure. I have not found an obituary or death announcement to confirm this date. John Weldon was recorded in the 1880 U. S. Census, age 9, living with his father, Patrick Weldon, age 58, born Ireland, locksmith, on Weavertown Road, West Hoboken, New Jersey. In the 1900 U. S. Census he lived on Violet St., West Hoboken, and his occupation was recorded as "Real Estate Agent." In 1910 and 1920 he still lived on Violet St., West Hoboken, and he was "Proprietor, Iron Works" and "Iron Works, Self." In 1930 and 1940 he lived on 19th Street, Union City, New Jersey, when he was, first, "Runner, Brokerage" and then "Iron Worker, Own Business." I do not know either the name or location of the 1940 business. 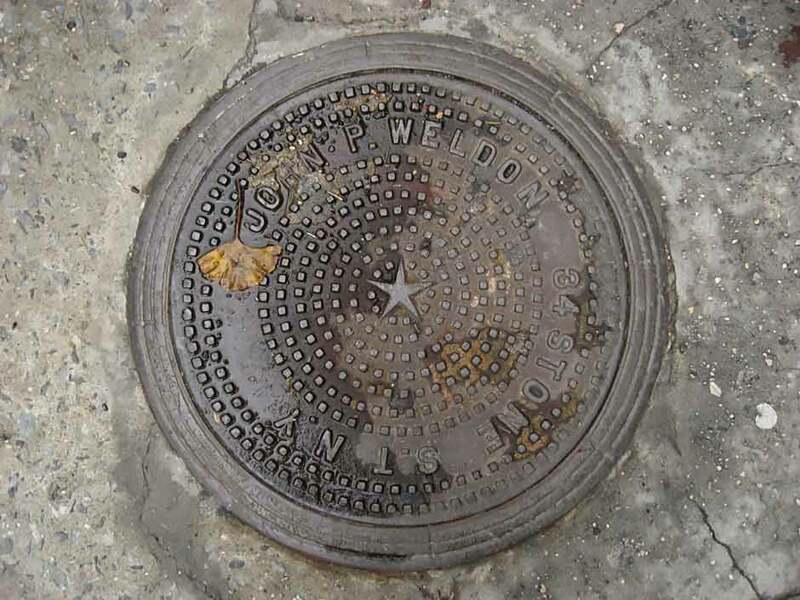 Other John P. Weldon coal chute covers are found at 418 West 20th Street and 178 Bowery.